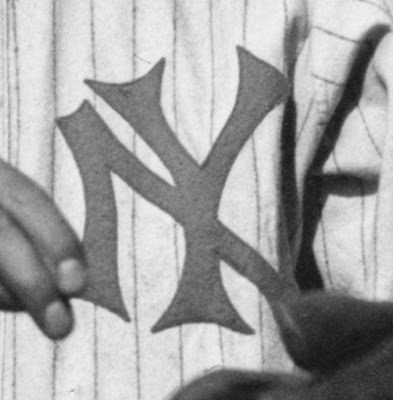 It wasn’t until 1909 that the most recognizable insignia in sports—the interlocking “NY”—made its first appearance on the caps and left sleeves of Highlanders uniforms. 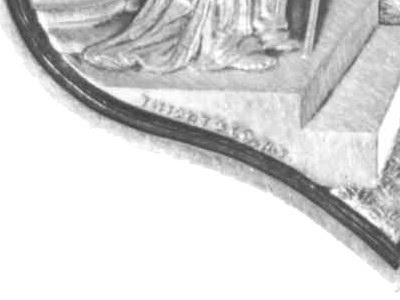 The design was created in 1877 by Louis B. 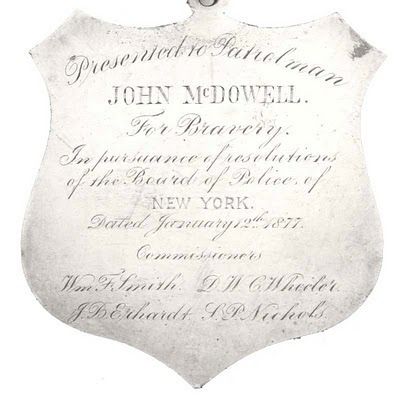 [sic] Tiffany for a medal to be given by the New York City Police Department to Officer John McDowell, the first NYC policeman shot in the line of duty. Perhaps because one of the club’s owners, Bill Devery, was a former NYC police chief, the design was adopted by the organization. We've just passed the centennial of the famous logo and the story intrigued me, so I thought I'd take a further look. For the 16th straight year, New York City employees who work in the Bronx and who demonstrated valor will receive gold-plated medals. They are based on a medal of valor designed for the Police Department by Tiffany's in 1877. The stylish "NY" on that medal later became the symbol of the Yankees. Surely the story must predate that Times article, but I can't seem to track it down. 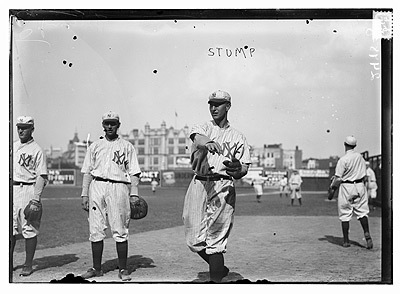 By the way, the nickname "Yankees" would not truly take hold with the New York American League ball club until the 1910s. In the first decade of the club's existence it was more often referred to as the New York Highlanders or New York Americans. However, for purposes of this blog entry, I'll be calling them the Yankees. At 3 o'clock in the morning on January 8, 1877, Officer John McDowell was walking down Seventh Avenue when he noticed something amiss at Courtney's Liquor Store. A light was on and the door had been forced open, so the officer entered. There he found three burglars with their loot: $120 worth of cigars. One of the burglars, a 19-year-old named James Farrell (sometimes referred to as George Flint), attempted to escape. As he rushed past McDowell, the policeman struck him with his club. The burglar drew a revolver and fired, the bullet hitting McDowell behind his left ear and passing out his right temple. While the other burglars escaped, the seriously wounded officer managed to wrestle Farrell to the ground, at which point a number of other officers came upon the scene and arrested the burglar. The heroic police officer eventually recovered from his wounds and was given $1,000 for his bravery by the Trustees of the Riot Relief Fund. 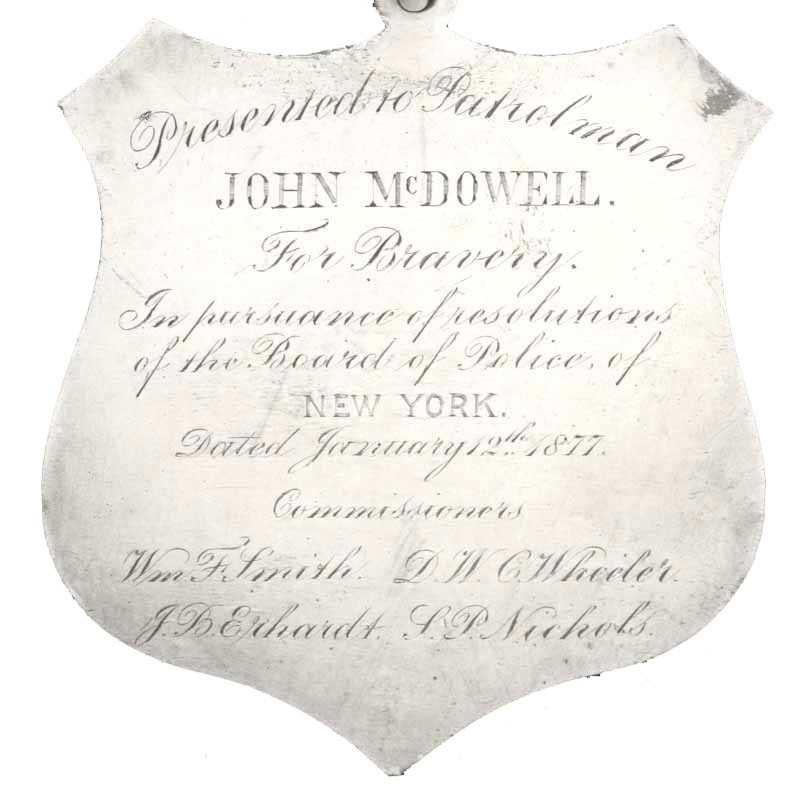 Additionally, McDowell was awarded the New York City Police Department Medal of Valor. In short, Officer John McDowell was indeed shot in the line of duty and did receive the Medal of Valor. Yesterday morning, shortly before 3 o'clock, two burglars, who had broken into Mr. Logan's bakery in Ninth st., near Avenue C, were discovered by one of the inmates of the premises, and made a hasty retreat, pursued, however, by the individual who first saw them. He called for help, which attracted the attention of policeman James Cahill, of the Eleventh Ward, who, seeing the rascals running off, gave chase and came up with them on the corner of Tenth st. and Avenue B. He immediately closed in with them and a struggle ensued, and during its continuance of a few minutes several pistol shots were discharged, when the two men, who had been struggling with the officer by a female from the upper window of Mr. Simpson's residence near by ran off. The reports of the pistol being heard by officers Lake and Vermilyea, of the same district, they hastened to the spot, and saw their associate holding on to a small tree and staggering as if about to fall. They asked him if he was shot, in response to which he gave a groan, sank to the pavement, and expired in a few seconds afterward. His dead body was immediately conveyed to the Police station by the officers, where it awaits the holding of the Coroner's inquisition. As a side note, one of the Police Commissioners listed is a gentleman named DeWitt C. Wheeler. I have been unable determine the relationship between this DeWitt C. Wheeler and the DeWitt C. Wheeler who produced the song slides for Take Me Out to the Ball Game in 1908 (see my blog entry on the subject). I suspect that the two were indeed related. A close examination of the lower left edge of the medal reveals the words "TIFFANY & CO., N.Y.," so it seems a safe bet the medal was designed and produced by the famous company, though it was almost assuredly not designed by Louis C. Tiffany himself. Chicago Daily News negatives collection, SDN-003882. Courtesy of the Chicago Historical Society. 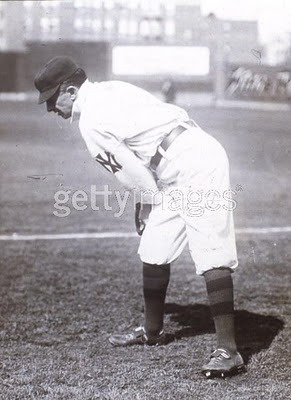 So, in 1909 there was really nothing new about interlocking and centered letters as logos in baseball. Both New York teams were using them, as were the 1909 Cardinals and even the 1909 Pirates ("PBC" standing for "Pirates Baseball Club"), as seen at the National Baseball Hall of Fame's online exhibit, Dressed to the Nines. 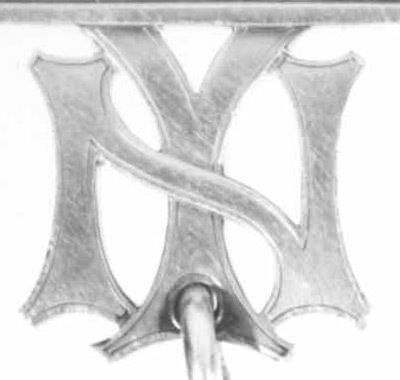 In both the medal and the Yankees logo, the "N" has concave vertical "bars"
In both the medal and the Yankees logo, the point where the two separate elements (the "V") at the top of the "Y" join occurs just above the angled cross-member of the "N"
In both the medal and the Yankees logo, the bottom of the "Y" features a distinct concavity, as do the bottoms and tops of the "N"
Finally, what of the supposed link between the medal, the logo and Yankees co-owner Bill Devery? 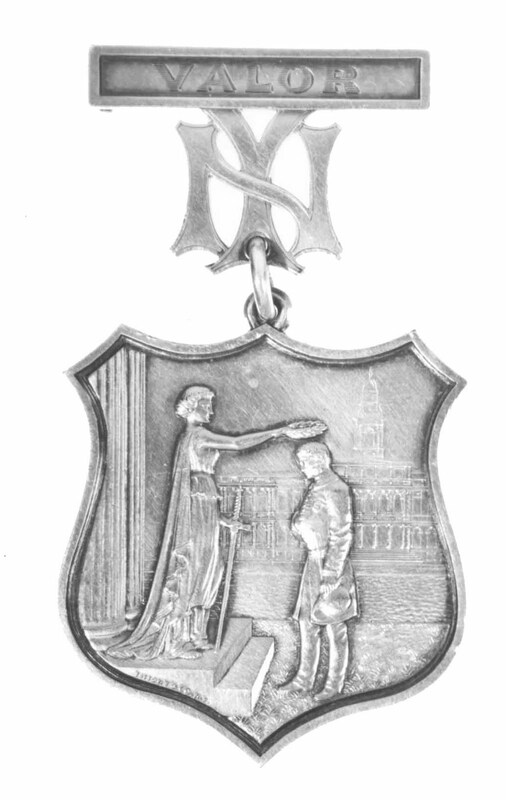 Most sources state that Devery joined the New York City police force in 1878, the year after McDowell earned the Medal of Valor. Twenty years later the man known as "Big Bill" had worked his way up to Chief of Police. 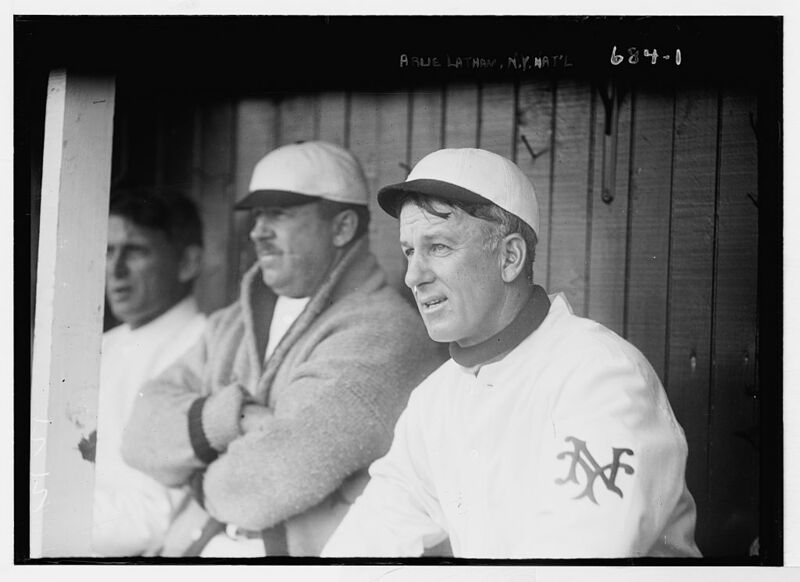 Along with Frank Farrell, Devery was co-owner of the Yankees starting in 1903 and ending with the sale of the club to Jacob Ruppert and Tillinghast L'Hommedieu Huston in 1915. 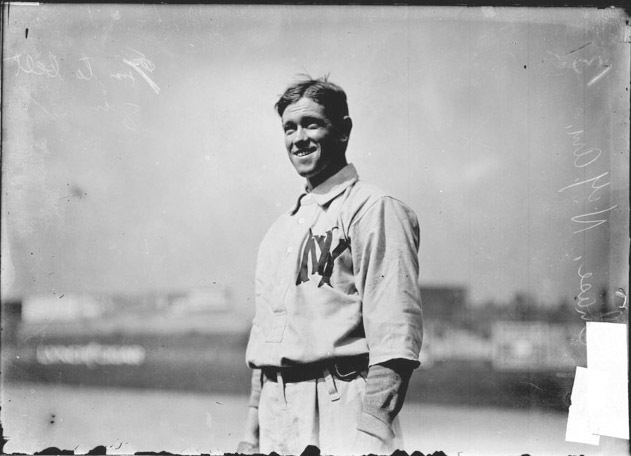 So, Devery was indeed with the Yankees at the time the logo was adopted for the 1909 season. But why would Devery (or anyone else for that matter) harken back to a somewhat obscure police medal as an inspiration? That question remains unanswered. I've found no "smoking gun" to help solve the mystery. Indeed, there doesn't appear to be a single reference to the Yankees adopting a new "NY" design in newspaper coverage in 1909, let alone a reason for the introduction of the logo. Perhaps one of my readers can shed additional light on the story? Great research! They should put you on the Kennedy Assassinaton case. I have a postcard depicting the Fire Department of N.Y. City copyrighted 1905 by De Witt C. Wheeler. I'm thinking he might have been a photographer. Great article, I was doing research to put this into my yankee tattoo and this was very helpful, when the tattoo is finished I'll send you a photo of it. Strong research and good article. Thank you Mr. Shieber and the New York City Police Museum for the details and pictures. I haven't found this information anywhere else. Devery was a notoriously corrupt member of the New York Police Department, as well as Tammany Hall. He was indicted for bribery and corruption BEFORE he headed up the police department. The Yankees were founded through the spoils of Tammany Hall corruption and graft. It is hilariously ironic, though not surprising, that Devery used Tiffany's NYPD Medal of Honor design for the Yankee's logo as a tribute to himself and his ties to the NYPD. You are correct big bill is(was) my great great grandfather and did ithe as a tribute to himself. BTW, the Yankees no longer claim McDowell was the "first" New York Police Officer shot in the line of duty, the text on the bronze plaque in Monument Park was corrected with the opening of the new MP in 2009 to simply read "...a police officer shot..."
nice to see those pics---specifically, the superb details on the medal. up till now, I was unaware of their intricacies. good stuff! I was awarded that medal in 1996 as a member of the NYPD. I am curious why you asserted the design "was almost assuredly not designed by Louis B. [sic] Tiffany himself." Did that information come from Tiffany & Co.? I doubt it. Louis Comfort Tiffany was the company's first Director of Design, and his personal works show a style which is quite evident in this medal. He may not be the lone designer, but it was created under his direct supervision and released only with his personal acquiescence. Tiffany's always have been, and are still very possessive of their trademarks (even the wavelength of their famous shade of blue is copyrighted). Now, you'll notice that on the Yankee logo, a tiny TM is next to a logo with convex, if not straight lines at all end points - not all concave as in the Tiffany design. I've run into a slight discrepancy on the patrolman's name: one article gives his last name as McDonnell while another gives it at McDowell. Slightly the same for the burglar apprehended: J Farrell vs G Fling (altho one seems to be mentioned as an alias for the other).